Periscopic Electron Cone 7.6 cm / 15 degree - Radiation Products Design, Inc. 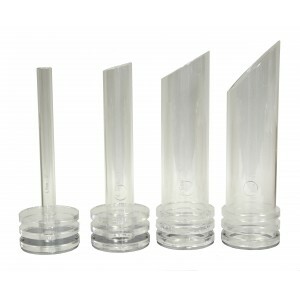 The periscopic electron cones are clear acrylic cylinders which are 3.1 mm thick and 30.5 cm long. The top of each cone has three acrylic spacer rings which slide into the barrel of the periscopic viewer. When the bottom of the periscopic electron cone is flush with the end of the periscopic viewer barrel the distance from the bottom of the periscope to the center of the cone angle is 25 cm. A 4.8 mm thick brass plate with a center hole is attached to the top of each periscopic electron cone. The brass plate collimates and prevents electrons from the penetrating the acrylic spacer rings. There is a 2.5cm diameter hole in the side of the cone allowing easy access for TLD placement or a fiber optic light source. Any of the periscopic electron cones will fit in any periscopic viewer made by Radiation Products Design, Inc.